Introverts represent ⅓ to ½ of all workers, yet companies often fail to provide work environments that bring out their best. In her bestselling book, Quiet: The Power of Introverts in a World That Can’t Stop Talking, Susan Cain suggests workers are often left dealing with the stimulation of their workplace with little opportunity to tailor their environment based on their mood or need for privacy and focus. Susan Cain Quiet Spaces by Steelcase offer five diverse ways to empower introverts at work. Each space supports specific postures, work modes, and expectations for quiet and privacy supported by a carefully chosen range of architecture, furniture, materials and technology. Every quiet space is designed with V.I.A. which provides superior acoustic performance and offers an atmosphere where introverts can work their best. 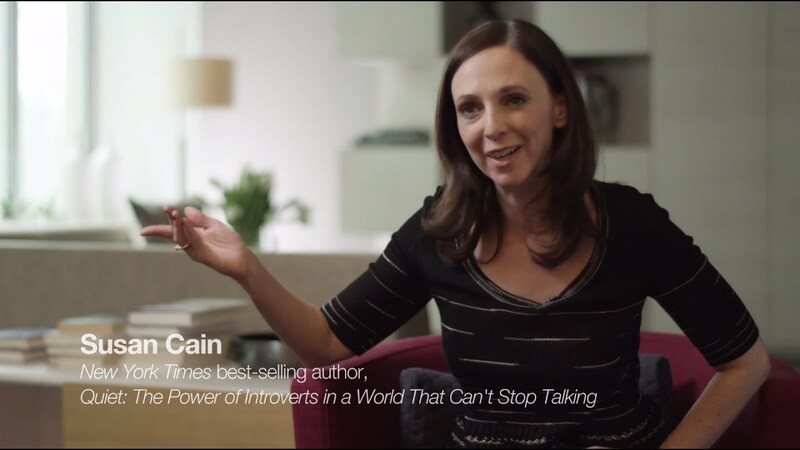 The Quiet Revolution, Susan Cain’s new mission based company, was established in 2014 as a way to convert the unique awareness generated by her best-selling book Quiet: The Power of Introverts in a World That Can’t Stop Talking into action. With its mission to “Empower Introverts For The Benefit of Us All,” the Quiet Revolution launched its first initiatives in 2014 in the world of work. Quiet Revolution’s worker training organization, the Quiet Leadership Institute, is delivering outcomes-based training solutions to leading organizations that unlocks the value of introverted workers by making them aware of their unique strengths and empowering them to act. Permission to be alone. Private, quiet spaces free from interruption support focus and innovation, providing a respite from an otherwise highly stimulating workplace. Making these spaces available to introverts signals that the organization understands and respects their need to work differently. Control over the environment. Introverts are more sensitive to stimulation and have a greater need for control over their environment. They also have a lower tolerance for external forces such as noise and light, so it’s important for them to be able to control these elements in the workspace. Sensory balance. Contrary to what one might expect, introverts seek sensory stimulation, but often in the form of warm, calming influences, such as natural woods and other organic materials. Psychologically safe. Introverts often feel like they’re perpetually on stage, as if all eyes are on them. At times they need spaces where they can choose to be unseen, and where they can’t see others, for either rejuvenation or focus. A warm and receptive destination that offers introverts permission to be alone and be themselves. A space free from the gaze and interruption of others, encouraging vitality by lounging, working or even closing your eyes for a few moments. Lagunitas lounge sofas provides comfortable and familiar seating, and includes power to support mobile devices. Personal table supports working on mobile devices while lounging. Storage acts as guest seating for an invited guest, or a place for personal belongings. V.I.A. superior acoustic attributes keeps noise distractions at bay. V.I.A. with integrated monitor allows amplification of digital content. Lighting integrated in V.I.A. allows users to control the level of lighting in the space. RoomWizard II allows the space to be reserved ahead of time or on the spot. A place free from visual and audible distraction or interruption for deep focus, strategic thinking and getting into flow. Natural materials create a calming state of mind, providing a place for focus, free from physical and cognitive distraction. V.I.A. provides a space to display analog content. Elective Elements desk is large enough to spread out content. Elective Elements bookshelves are equipped with analog resource material to support strategic thinking while also providing a space for personal belongings. Guest seating on storage allow users to invite guests if appropriate. An active environment where individuals can escape and rejuvenate through activity and stretching while also recharging by contemplating and reflection. Control of the space is in the hands of the user, allowing them to customize lighting, music, volume and digital content based on their mood, task or personality. The open floor space allows users the opportunity to stretch, meditate and reset. V.I.A. offers integrated speakers that allow users to control the mood of the space. Hosu lounge seating supports relaxed and informal postures. The integrated monitor in V.I.A. can be used to view the digital content needed to rejuvenate. Storage creates a space for analog and digital resource material. An informal destination to connect, share and build trust before, during or after a meeting. The lounge posture creates a relaxed, comfortable environment, while tools throughout the space support working and sharing of digital content. Lagunitas provides a comfortable and informal seating option, much like a couch in a living room. The divided sofa at 90 degrees offers specific places for people to sit perpendicular to one another, creating an individual sense of space and psychological safety. Space where introverts can engage in deep conversation with a colleague, display and discuss content quickly and easily in confidence. A safe space to build trust, where information and ideas can quickly and easily be shared. Both content and conversations can remain confidential. Integrated media:scape allows workers to actively edit and build digital content while the whiteboard supports analog brainstorming. The integrated monitor in V.I.A. can be used to view the digital content. Storage creates guest seating for a third guest, as well as a place for personal belongings. 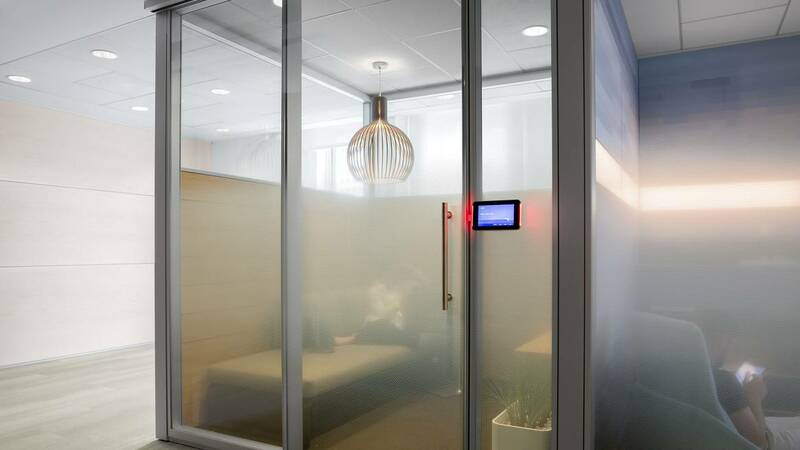 90% of today’s workers say they need quiet, private places in the workplace. Over 40% say they don’t have them. While doing project work, on average workers are interrupted every 11 minutes. When interrupted, it can take anywhere between 23-25 minutes to get back into flow. Moving while working makes for healthier, more-engaged workers. A palette of postures and stretching of muscles supports creative thinking, problem solving and idea generation. 31% of full time employees do most of their work away from their employers’ location. Workers are looking to eliminate distraction, but also seek physical and emotional comfort and familiarity that is often found more at home than in the office. When collaborating, workers meet nearly half the time with only one other person.